Daisuke Takahashi of Japan wins his fourth NHK Trophy title. Daisuke Takahashi of Japan skated to a clear victory at the Men’s event as the NHK Trophy figure skating event wrapped up Sunday. Teammate Takahiko Kozuka took the silver, while USA’s Ross Miner jumped from sixth place after the short onto the podium to capture the bronze medal. Takahashi shone again in his expressive Blues for Klook program. Ever ready for the challenge, the Japanese went for the quad flip – a jump nobody has performed yet in competition – but he missed it and it was underrotated. However, the 2010 World Champion did one in the warm up. Takahashi overcame the fall quickly to produced two triple Axels and four more triples, however, he underrotated a triple loop and a triple toe. The Olympic bronze medallist got a level four for two spins and a level three for the footwork and the camel spin. He posted a new season’s best score with 169.32 points and took the title with 259.75 points overall. 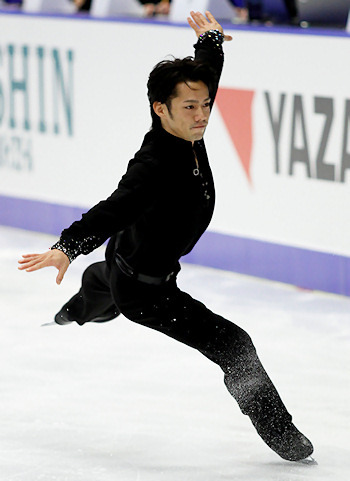 Wining NHK Trophy also meant that he qualified for the Grand Prix Final. Kozuka hit two triple Axels and four more triples, but two-footed and underrotated the quad toe in his routine to Nausicaa Princess of the Wind. The 2010 World silver medalist scored a new season’s best of 155.25 points and totaled 235.02 points. Miner gave a solid performance to The Untouchables soundtrack, completing two triple Axels, four more triples, and three level-four spins. He only stepped out of his first triple Lutz. The 20-year-old placed fourth (141.24) for this performance, and moved up to third (212.36) overall. There was a lot of movement in the standings as other skaters also moved up while others dropped. Samuel Contesti of Italy came from seventh to fourth at 209.69 points, and Tomas Verner of the Czech Republic pulled up from ninth to fifth with 196.63 points. Contesti was ranked third in the free with his playful medley of French Chansons including Valse a mille temps. He nailed six triples, and only put down his hand on a triple loop. Verner looked much more solid than in the short program on Saturday. He put out the quad toe, but took a painful looking fall on the triple Axel, and then tripped and fell again in the choreographed step sequence. Konstantin Menshov of Russia, who stood in fourth after the short, finished in sixth overall. He fell on a quad toe and a double Lutz. USA’s Brandon Mroz was third in the short, but he had a terrible day. He crashed on a cheated quad Lutz and singled four jumps in the second half of his program to fade to ninth.